ROLLER SKI SAFETY ALERT | Birkebeiner Nordic Ski Club Inc.
Roller skiing is great ski specific training and fun. UNSAFE AND ANNOYING behaviour of roller skiers has been observed recently. This may not be locals, BUT as a reminder, here are some fundamental safety guidelines that when observed, will also demonstrate respect for the public and avoidance of HAZARDOUS behaviour. Whilst this is directed to people in the Kiewa and Ovens Valley, it is applicable everywhere. 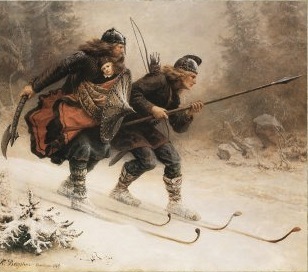 It is the responsibility of the individual to roller ski in a safe manner. Due care and common sense must be exercised and surface and weather conditions assessed. In general it is recognised that wheeled recreational devices are not to be used on roads with dividing lines or median strips, and that common sense must prevail. There are many roads falling within a theoretically acceptable definition that may be potentially hazardous, so once again, common sense and being mindful of drivers unfamiliar with this activity and form of training is vital. The BNSC Roller Ski Policy will be available on the BNSC website shortly.